For those of us who went to bed last night knowing where our children were, or where our mothers were, grannies respond were out in front of a cruel, inhumane, and just plain WRONG prison benignly named "residential" center protesting the fucked up incarceration of Black & brown children & mothers who r fleeing u.s.ofamerikkka inflicted & sponsored violence in their countries of origin. THIS is what has made amerikkka great in the past, & continues to make us great today: the exploitation & occupation of the lands & resources & life of other peoples around the world. After we bring another country's life and resources under our control, after we flood that country with knowledge & weapons to kill their own people, after we bomb the infrastructure & contaminate everything from the water to the humans, we then commit more unthinkable violence against those attempting to escape, to survive, to protect their children by rounding them up & throwing them into jails we sooooooo kindly calll 'residential' & 'centers'. And then several thousand CHILDREN have been snatched from their mother's arms and thrown into their own jail. 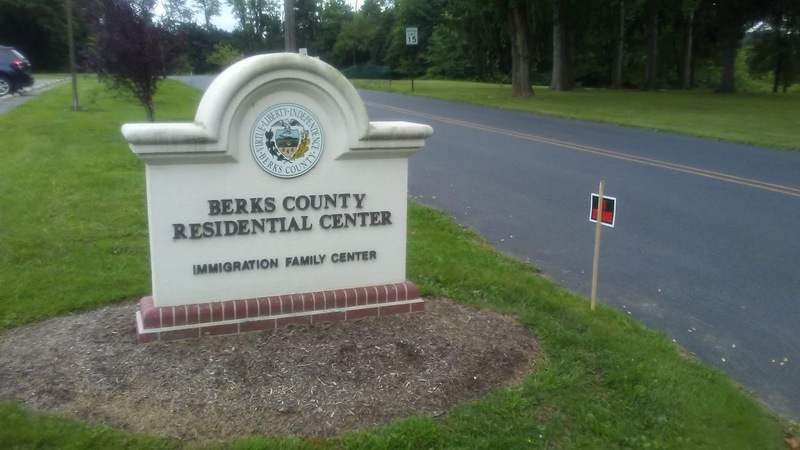 I joined the grannies last nite at such a cruel place called Berks in Reading PA. Come here, where children r imprisoned, children whose parents r trying desperately 2 protect them. SHUT DOWN BERKS!